Ghrelin is a 28 amino-acid pepptide hormone that is produced by P/D1 cells lining the fundus of the human stomach . In rodents, similar X/A-like cells in the stomach produce ghrelin. The small intestine, liver, pancreas, kidney, lung, pituitary, hypothalamus, placenta and testes also yield small amounts of ghrelin. Ghrelin is a potent stimulator of appetite. The discovery of ghrelin was reported by Kojima et al. in 1999. The name is based on its role as a growth hormone-releasing peptide, with reference to the Proto-Indo-European root ghre, meaning to grow. Originally identified as the endogenous ligand for the 'growth hormone secretagogue'(GHS) receptor, ghrelin was first thought to be mainly involved in the regulation of growth hormone secretion from the anterior pituitary gland; however, it was soon found also to be a potent orexigen (appetite stimulant) — sometimes referred to as the 'hunger hormone'. In humans, plasma concentrations of ghrelin increase progressively before meals and decrease after meals. Ghrelin is the only known orexigenic hormone produced by the gut, and the only known orexigenic molecule in the blood circulation. In some respects it can be considered as a counterpart of the hormone leptin; leptin, a hormone produced by adipose tissue, suppresses appetite (an anorexigen). 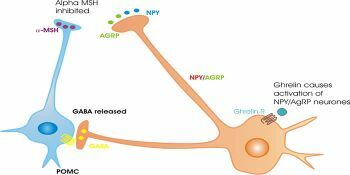 Receptors for ghrelin (G-protein coupled membrane receptors, variously called GHS receptors or ghrelin receptors) are expressed in the anterior pituitary and in several areas of the central nervous system. Receptor expression is at particularly high densities in neurons of the arcuate nucleus and the ventromedial nucleus of the hypothalamus. There is also evidence that ghrelin may also be made by a small population of neurons in the arcuate nucleus. In rats and mice, systemic or central application of ghrelin increases food intake and increases fat mass (adiposity)  as a result of its actions at the hypothalamus. Sustemic injections of ghrelin activate cells in the arcuate nucleus including the orexigenic neuropeptide Y (NPY) neurons, as well as the neuroendocrine neurons that secrete growth-hormone releasing hormone. Ghrelin-responsiveness of these neurones is both leptin- and insulin-sensitive, tending to have a suppressive effect. Ghrelin also activates the mesolimbic cholinergic-dopaminergic reward link, a neural circuit that communicates the hedonic and reinforcing aspects of natural rewards, including food, as well as of addictive drugs, such as alcohol. Ghrelin exists in both an inactive (pure peptide) and an active (octanoylated) form (see Hexatropin). The physiological importance of ghrelin as a regulator of growth hormone secretion is still unclear, but there is concern that the ability of ghrelin agonists to stimulate growth hormone secretion might lead to abuse by athletes. There is some evidence that defective ghrelin signalling result in short stature in humans. There is also evidence that altered ghrelin signalling might be a factor that contributes to obesity. Clinically, the ability of ghrelin to stimulate appetite indicates its potential value in the treatment of cachexia. Obestatin is a closely related hormone that was reported, in late 2005, to decrease appetite. Both obestatin and ghrelin are encoded by the same gene; the gene's product is cleaved to yield the two peptide hormones . The physiological significance of this is unknown. ↑ Bowers C et al. ↑ Hameed S et al. (2009). Gut hormones and appetite control Oral Diseases 15:18-26. ↑ Lall S et al. (2001). "Growth hormone (GH)-independent stimulation of adiposity by GH secretagogues". Biochem Biophys Res Commun 280: 132–8. PMID 11162489. ↑ Tschöp M et al. (2000). "Ghrelin induces adiposity in rodents". Nature 407: 908–13. ↑ Hewson AK, Dickson SL (2000). "Systemic administration of ghrelin induces Fos and Egr-1 proteins in the hypothalamic arcuate nucleus of fasted and fed rats". J Neuroendocrinol 12: 1047–9. PMID 11069119. ↑ Dickson SL et al. (1993). "Systemic administration of growth hormone-releasing peptide activates hypothalamic arcuate neurons". Neuroscience 54: 303–6. DOI:10.1016/0306-4522(93)90197-N. PMID 8492908. Research Blogging. ↑ Dickson SL, Luckman SM. (1997). "Induction of c-fos messenger ribonucleic acid in neuropeptide Y and growth hormone (GH)-releasing factor neurons in the rat arcuate nucleus following systemic injection of the GH secretagogue, GH-releasing peptide-6". Endocrinology 138: 771–7. PMID 9003014. ↑ Hewson AK et al. (2002). "The rat arcuate nucleus integrates peripheral signals provided by leptin, insulin, and a ghrelin mimetic". Diabetes 51: 3412–9. pmid=12453894. ↑ Jerlhag E et al. (2004). "Ghrelin stimulates locomotor activity and accumbal dopamine-overflow via central cholinergic systems in mice: Implications for its involvement in brain reward". Addiction Biol 11: 45–54. DOI:10.1111/j.1369-1600.2006.00002.x. PMID 16759336. Research Blogging. ↑ Jerlhag E et al. (2007). "Ghrelin administration into tegmental areas stimulates locomotor activity and increases extracellular concentration of dopamine in the nucleus accumbens". Addiction Biol 12: 6–16. PMID 17407492. ↑ Hewson AK et al. (2002). "The rat arcuate nucleus integrates peripheral signals provided by leptin, insulin, and a ghrelin mimetic". Diabetes 51: 3412–9. DOI:10.2337/diabetes.51.12.3412. PMID 12453894. Research Blogging. ↑ Yildiz BO et al. (2004) Alterations in the dynamics of circulating ghrelin, adiponectin, and leptin in human obesity Proc Natl Acad Sci U S A 101:10434-9 PMID 15231997. Cummings DE, et al. (2002) Plasma Ghrelin Levels after Diet-Induced Weight Loss or Gastric Bypass Surgery. New England Journal of Medicine 346:1623-1630. This page was last modified 09:16, 22 July 2011.